Odisha will get its first oceanarium, a mega marine life aquarium, on the Konark-Puri Marine Drive. Soon, you’ll be able to walk through a huge underwater viewing tunnel, come face-to-face with marine life and see how dolphins and whales interact with each other, right here in Odisha. The oceanarium, which will be built in public-private-partnership mode, will exhibit around 200 species of marine animals that will include rare species from the Bay of Bengal such as the dolphins, the whales and many other sea animals and plants from different countries. Odisha Tourism Development Corporation (OTDC) has been closely following the oceanarium designs in Sentosa in Singapore, Manila in the Philippines and the ones in Australia and England. 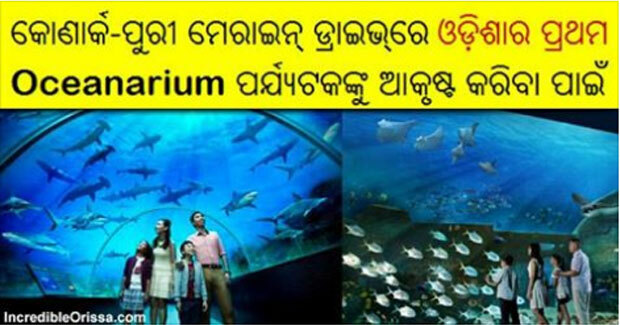 Oceanarium project will not only boost tourism in the golden triangle area of Bhubaneswar-Puri-Konark, but also help ancillary development of the surrounding areas since local people will be employed.